As a Skyhawks franchisee, you will focus on promoting Skyhawks programs and selling Skyhawks services. Your task is to use your sales and marketing skills, your enthusiasm for athletics and your vision of healthy youth to develop one of the most popular sports programs in the country. You will concentrate on selling your services to community-based organizations that serve children. Although a majority of Skyhawks programs are offered in the summer, as a franchisee you will also have the ability to program athletic events throughout the year. After-school, weekend and holiday programs are available to the ambitious franchisee. No matter what the season, the core purpose of the franchisee is to teach life skills through athletics. Sales training and support so you can maximize your program offerings. Technical support for our proprietary event management web-based software system. Call center support capable of handling incoming and outgoing calls with customers and coordinators. Human resource and risk management department to provide you with the tools to recruit, train, and employ part-time coaches. Franchisees are responsible for hiring and supervising their employees. An accounting department to assist you with invoicing for your services. A marketing department to assist you in creating and implementing your marketing strategy. A dedicated Account Manager to handle day-to-day questions. A website capable of processing online registrations for all of your programs... And more! Since 1979, over 1,000,000 children have participated in a Skyhawks program! Skyhawks is the nation's leader in sports programs for children." Skyhawks is a brand with national exposure and appeal – and offers you a dependable and rewarding business to own. 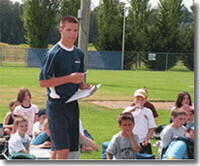 With the Skyhawks system, you will teach children and young adults meaningful life lessons through athletics, provide coaching services and operate athletic camps and programs in a variety of sports for local schools, park and recreation departments and other community-based organizations – wherever children are found. Ultimately, you will make a difference in your world. Skyhawks has developed a system to sell its services, market its programs and hire and train employees to implement those programs. The Skyhawks Program is founded upon coaching philosophy and methodology that have evolved and been fine-tuned for over 25 years. The Skyhawks Program also includes marketing strategies and the technology to manage events, marketing and staff, all of which are clearly outlined in the manual. To take the first step towards owning a Skyhawks franchise, please contact us using the form below. We will review the information submitted and will contact you with more details about becoming a Skyhawks franchise owner.